PCOS Diet, PCOS recipes, Poly Cystic Ovary Syndrome Indian recipes. Poly Cystic Ovary Syndrome (PCOS) is a health condition in which multiple cysts are formed on a woman’s ovaries due to over-production of hormones. The symptoms of PCOS include irregular periods, weight gain, increased facial hair growth and acne. If the symptoms are not controlled, it can lead to diabetes, hypertension and heart disease. PCOS is also one of the leading causes of infertility among women in their reproductive years. Although doctors prescribe medicines, no treatment for PCOS can be successful without proper changes in diet and lifestyle. Weight management is important to increase insulin sensitivity and regulate blood sugar levels. • Brightly-coloured fruits and veggies: Include brightly coloured fruits and vegetables as they are great sources of fibre, antioxidants, vitamins and minerals. Brightly-coloured vegetables like carrot, tomatoes and capsicum are a rich source of antioxidants and should be a part of the PCOS diet. Antioxidants help in scavenging free radicals that are formed due to insulin resistance. Try vegetable recipes like Khumbh Palak, Suva palak methi sabzi, Gavarfali ki sabzi, and Masala Karela that are low in calories but rich in nutrients. 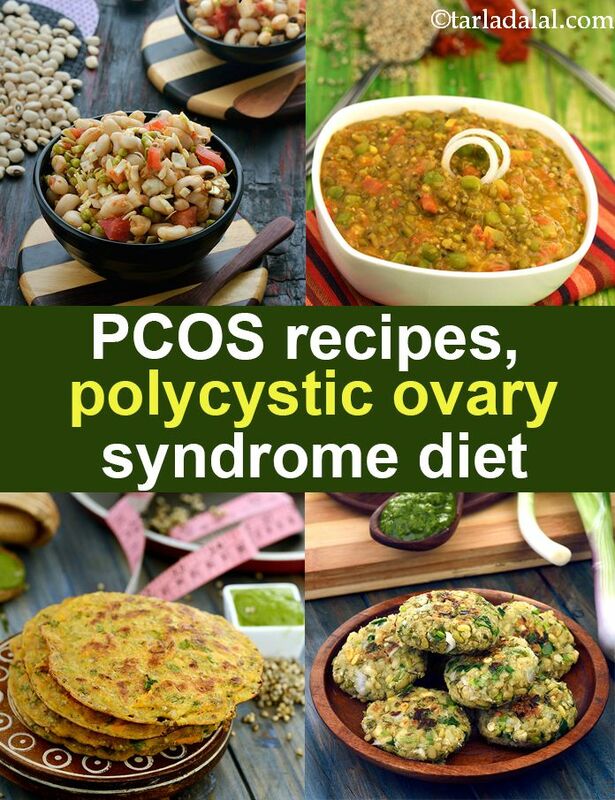 Look here for a full list of Indian pcos recipes. • Low Glycemic Index (Low GI) fruits: Oranges, apples, pears, grapefruit, and other low Glycemic index fruits can be consumed in their whole form along with the fibre, which helps in controlling blood sugar levels. Use your creativity to make recipes like karela juice and Orange, Grapefruit and Mint Salad. • Nuts and seeds: Have a few (4 or 5) nuts such as almonds, walnuts or pistachios, and seeds such as chia seeds (energy chia seeds drink woth lime and honey)and flaxseeds ( garlic flaxseed chutney), which have plenty of protein and healthy fats. Try Flax Seed Crackers with Beetroot Dip, homemade almond butter, as a healthy snack. • Whole grains and sprouts: Include whole grain cereals and pulses such as oats, quinoa, rajma, moong, black chana, ragi, jowar flour, buckwheat and sprouts of your choice. Being rich in fibre, these foods slow down the release of glucose into the bloodstream, thereby slowing insulin resistance. Try healthy recipes like Broken Wheat Upma, ragi roti, bajra roti or Quinoa Dosa for lunch or pcos breakfast recipes. If you have PCOS or want to live a healthy life, then follow the guidelines below. 1. High Glycemic Index (high GI) foods: Foods which have a high GI cause an immediate spike in blood sugar levels and must be avoided. These foods include rice, potatoes, white bread, cakes and pastries. 2. Dairy: Milk can cause an increase in acne, which is a symptom of PCOS. Dairy foods may also increase testosterone levels and cause the symptoms to worsen. However, it is best to take your doctor’s or dietitian’s advice regarding the consumption of milk. If you can tolerate curds, buttermilk and yoghurt, it is good to consume these as they are rich in calcium. Start by introducing small portions of milk products to see if there is any effect on your symptoms. 3. Soy Products: Completely avoid soy and soy products as it is proven that these delay ovulation. Avoiding soy products is especially important for women who are trying to conceive. 4. Bad Fats: Cut down your intake of saturated fats, trans-fats and hydrogenated fats such as margarine, butter and ghee as these can cause weight gain, diabetes and heart disease. 5. Refined Foods: These are to be totally deleted from the diet. So knock out the pizzas, burgers, breads and biscuits. 7. Sugary Products: All sorts of sweets, ice-creams and desserts have to be avoided. Enjoy our PCOS Diet, PCOS recipes, Poly Cystic Ovary Syndrome Indian recipes and other PCOS articles below.